Ginna Webster (centre) accepts the blood challenge trophy from Red Cross Blood Service’s Lyndon Beard and Indya Gall. 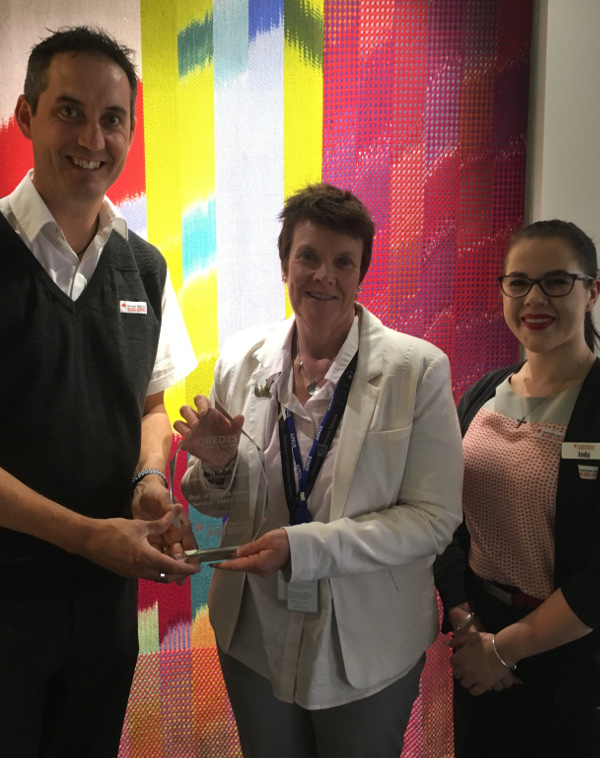 DHHS Tasmania was the clear state winner in the Health Services Blood Challenge (pipped nationally by a Queensland organisation). However, the real winners were the 618 people whose lives were saved by the 206 donations made by DHHS Tasmania during the challenge. Communities Tasmania Secretary Ginna Webster (pictured centre) accepted the winner’s trophy on behalf of Communities Tasmania and DoH staff. Congratulations to all staff involved. Communities Tasmania Secretary Ginna Webster accepts the blood challenge trophy from Red Cross Blood Service’s Lyndon Beard and Indya Gall. This page was generated on Saturday 20 April 2019 at 10:33pm.